Tienda Mexicana is one of numerous Hispanic-owned businesses that now occupy Heavener‚Äôs once dying downtown district. The Oklahoma Foods plant is Heavener‚Äôs largest employer with over 980 workers and a combined annual payroll of $26 million based on one report. Locals claim this plant has been the single greatest attraction for Mexican immigrants. Kansas City Southern has a long history with Heavener. Today the railroad uses Heavener as one of its main fueling depots. John Wilson was a long-time volunteer of the Heavener Police Department before resigning in protest over how he was supposed to deal with the town‚Äôs Hispanic population. Former Heavener police officer Shawn Covert is one of the most outspoken opponents of the community‚Äôs undocumented Mexican workers. Covert claims town officials prevented him from enforcing the law with regard to Heavener‚Äôs Hispanic population, prompting his resignation last year. Minerva and Manuel Martinez first entered the United States in 1997, and now run a small store and restaurant in Heavener‚Äôs old downtown. Martie Wisdom and Markey Anderson help run a local flower shop in downtown Heavener, and are among those who are glad to see the influx of Hispanic families into their community. HEAVENER—Atop Poteau Mountain, cloaked by white oak, black locust and other towering trees, sits the mysterious runestone. Ever since its discovery in 1874, experts have passionately debated whether the runic carvings on the stone were actually created by Viking explorers. Today, a new dispute grips this southeastern Oklahoma community of 3,414 residents. Only this debate strays far from the intellectual trenches of academia, and is laced with a mixture of warmth, frustration, compassion and anger. At its center are an estimated 1,410 Hispanic residents who account for 41% of Heavener’s total population, according to the 2010 Census. Based on an analysis by Oklahoma Watch, Heavener now has the third-highest concentration of Hispanic people in Oklahoma cities with 1,000 or more residents. Only Guymon and Watonga rank higher, with 52% and 47%, respectively. A 10-year, immigration-fueled surge has only added to the tensions. Since 2000, Heavener’s Hispanic community has nearly doubled, jumping from 22%, or 721 people, to the present 41%. Some locals dispute the accuracy of the official numbers, arguing that the presence of uncounted illegal immigrants makes the true figure even higher. In contrast to other Oklahoma communities where immigrants appear to be assimilating more smoothly, Heavener has been roiled by the rapid influx of newcomers. Neighbors argue openly, some locals say they’re ready to leave town, and two City of Heavener police officers resigned from the force in a dispute over immigration issues. “I’m 100 percent against illegal immigration,” said Shawn Covert, a former part-time police officer who left the force last year. “I’m 100 percent for deportation—the wife, the kids, everybody. When they crossed the border illegally, they committed a felony and they should be punished as such. Not everyone in Heavener shares Covert’s perspective. Throughout Heavener’s old downtown district are signs of a new beginning. 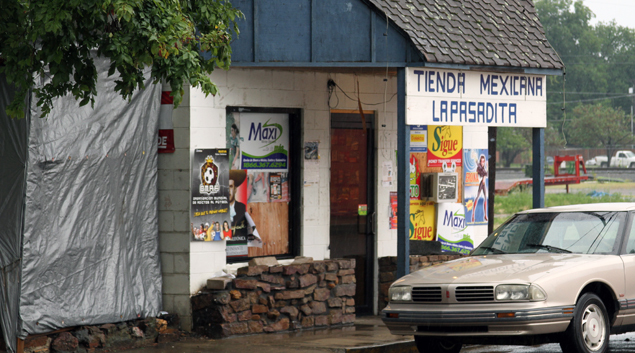 Mexican immigrants have moved businesses into four buildings on one street alone. One building—a former bar—is even being converted into a Catholic Church. Until recently, time forgot Heavener’s aged downtown as most businesses moved less than a mile south on State Highway 128. The story is all too familiar in rural communities across Oklahoma. But in Heavener, the new arrivals have given the story a fresh twist. “Some of the old-timers here want things to be like they were 40, 50 years ago when the downtown was thriving with businesses,” said Mike Kennerson, Heavener’s city manager since 2000. “Well, they’re not. Times have changed. So they blame the Hispanics. In fact, in some quarters, the Hispanics are blamed for all our ills. But the fact is they are making positive contributions to Heavener. Heavener’s fate changed in 1988 when local organizers successfully recruited Oklahoma Foods. The company opened a chicken hatchery that year, bringing greatly needed jobs to an economically starved Le Flore County. In 1995, the company added a massive processing facility. Today, Heavener is home to a plant where workers kill and de-bone chickens, as well as a neighboring feed mill and hatchery where the birds are carefully monitored from birth. Based on a 2009 report—the most recent data available to city officials—the company employs 985 workers with a payroll of $26 million. Oklahoma Foods is by far Heavener’s largest employer, and without question, the principal magnet for Mexican immigrants. “I remember back when we first heard news that the plant was coming to town,” recalled Martie Wisdom, a 1968 Heavener High School graduate who manages a downtown flower shop. “Everyone was so excited. Everyone was going to work there, and many did. Then a lot of them found it was hard work. So what did they do? They quit. “I knew things were bad when my son (Nicholas, 5) came home from school his first day of pre-K,” said Silva, 33. “He said, ‘Mommy, no one in my class speaks English.’ Not only are they coming here illegally and taking our jobs and milking our system, but they’re not even trying to assimilate. We have kids going all the way through school who aren’t even trying to learn to speak English. Silva, ironically, married a Brazilian immigrant 13 years ago. She said her husband, Neto Silva, first entered the United States with a student visa. Today he is an American citizen serving a 90-day tour in Afghanistan with the Air National Guard. He became a legal citizen in 2008, nine years after the couple’s wedding day. Silva seethes at the thought of others taking short-cuts. She isn’t alone. The former police officer said he resigned from his part-time post on July 1, 2011, when a superior told him he was required to give arrestees 30 minutes to post bail before transporting them to the Le Flore County jail 13 miles away in Poteau. Federal immigration officials are commonly notified by a county jailer if an individual can’t legally prove his or her residency after a reasonable search. Covert interpreted this directive as “an appeasement” to illegal immigrants and an obstruction of his sworn duty as an officer of the law. City Manager Kennerson contends Covert went out of his way to harass Hispanic residents. “Look, if someone gets into trouble and they are proven illegal, then we let the law take its course,” Kennerson said. “Here’s the problem: We do not have federal immigration training, and therefore it is not up to our police officers—Shawn Covert or anyone else—to determine who is or isn’t a legal resident. No local government, whether acting through its governing body or by an initiative, referendum, or any other process, shall enact any ordinance or policy that limits or prohibits a law enforcement officer, local official, or local government employee from communicating or cooperating with federal officials with regard to the immigration status of any person within this state. Police Chief Ty Armstrong defends the actions of his officers, saying his department does not promote policies—verbal or otherwise—that create a sanctuary for illegal immigrants. Armstrong points to an incident a couple years ago as an example. Tranquility seems to emanate across the valley that encompasses Heavener’s city limits. The land—once part of the Choctaw Nation—is plush with greenery, bordered by the scenic Winding Stair Mountains to the south and Poteau Mountain to the north. The land is filled with an abundance of natural resources. The logging industry has long served as a staple of the local economy, as well as the dozens of rock quarries that still checker the countryside. They, too, have become magnets for Mexican immigrants. Heavener also has shared a long and storied history with the Kansas City Southern Railway Company, which now uses a local depot as one of its main fueling stops. Heavener, in short, is the portrait of prosperity to Mexican immigrants like Manuel and Minerva Martinez. They journeyed to the United States in 1997 from the far southern Mexican state of Oaxaca, first living in Texas before hearing of opportunities in Heavener. Minerva, meanwhile, runs a little taqueria and store in Heavener’s old downtown district. Their four children—Luis, 14; Edward, 11; Klen, 10; and Benji, 7—attend public school and can often be seen visiting the local library down the street from the family’s business. The couple emphasizes education. Minerva said she was forced to leave school after the eighth grade, while Manuel dropped out after the fifth grade to go to work. “In Mexico,” Minerva explained, “you have to pay to go to school. Only the wealthy could afford to send their kids to school. If you couldn’t come up with the money, you didn’t go. Cesar De la Rosa understands dreams. De la Rosa arrived in Heavener in 2001, having risked his life by crossing the border illegally in a desert region. He walked for three straight days and nights across the desert before reaching safety. Since then, De la Rosa has become a respected member of the community. For the past two years he has served the Heavener High School soccer team as an assistant coach. He has even been called upon by his Methodist Church to deliver a sermon from time to time. In 2005, De la Rosa spearheaded the creation of a summer soccer league. Thirty children played the first year. This summer the league catered to 68 children and five teams. “We started the program as a way to bring the Mexican children and American children together,” said De la Rosa, 42. “We noticed they were having problems getting along. But now we see almost no problems at all. Everyone seems to get along really well. De la Rosa, who works at the hatchery, hopes to help build a new soccer complex on city-owned land behind the Oklahoma Foods processing plant. Only he may not be around to see the complex become a reality. In May 2011, De la Rosa was arrested by local police after he failed to produce a valid driver’s license. A deportation hearing has been scheduled for him in February. John Wilson of Heavener said he was one of the arresting officers that night. He said he never patrolled specifically in search of illegal immigrants. Like Covert, Wilson also resigned his part-time post last July over the immigration issue. Prior to his resignation, he had served the department for 30 years. De la Rosa doesn’t understand the anger. Nor does it matter to him these days. Oklahoma Watch staff reporter Ron J. Jackson, Jr. is an award-winning journalist and author whose professional writing career spans 26 years. He spent 14 years with The Oklahoman, investigating stories statewide on topics such Mexican drug cartels, illegal immigration and unsolved homicides.